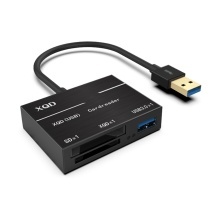 This is a fully functional, easy to use, support XQD/SD(HC) card reader. Support U disk, mouse and keyboard. ABS shell, small size and portable, easy to use and convenient to carry. USB3.0 transfer, up to 500M/s. High speed XQD card reader, customized for professional photographers. Support XQD/SD(HC) card reading, complete functions, more convenient. HUB function reads U disk, support U disk/mouse/keyboard. LED working indicator light, keep track of working status. ABS shell, good heat dissipation. Good compatibility, compatible with Windows/MAC-OS system. No need to set up the program, automatic identification, plug and play. Compatible with professional equipment, camera with XQD card.